Motorcycle Info Pages - Ride Safe, STAY SAFE! > Making eye contact! Why Motorcycles Appear To be Invisible! SMIDSY - "Sorry Mate, I Didn't See You"
A message for non motorcyclists: "How close does a bike / motorcycle have to be befor you see it?" DOT Think! 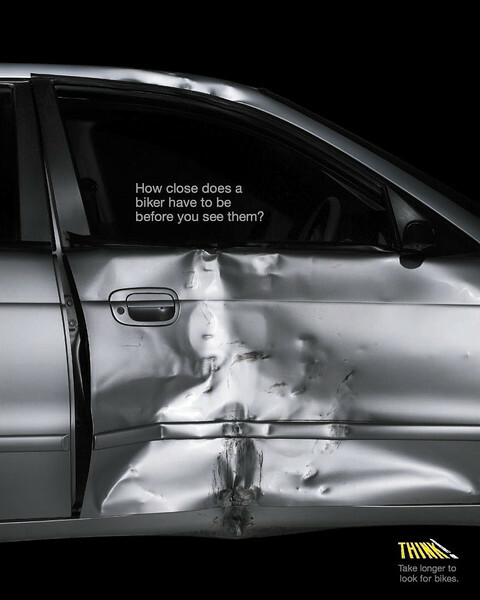 Campaign: "Take longer to look for bikes / motorcycles"
How often have we, as motorcyclists, seen this written, or heard it said about a near miss, or occasionally, a collision between a bike and a car? What I am about to relate would indicate why we should NEVER rely on this as an indication that we as motorcyclists have actually been seen.....the safest course of action is always assume you may NOT have been seen! The first day of July 2010 was warm, dry, and sunny. Early on that Thursday afternoon, two people very close to me were out for a ride on their 1970’s Triumph Bonneville, travelling from Dorking towards Guildford on the A25. They were heading for a local beauty spot, where other motorcyclists liked to meet, have a chat and a cup of tea, and discuss each other’s bikes, like you do. Near the village of Shere, on a section of the A25 known locally as the Shere by-pass, they were approaching a tee junction to their left. The road at this point is National speed limit, and they were travelling at about 55mph, a comfortable speed for a Bonny of that vintage, 2-up. As they approached the junction, the driver, John, could see two vehicles waiting to turn left, and a Ford Fiesta waiting to turn right across his carriageway. Seeing the vehicles, John dropped his speed to about 45mph, and eased out in his carriageway towards the white line, but a keep left island prevented him from moving very far. At the same time he was also observing the vehicles at the junction, and saw the driver of the Fiesta looking in his direction. Passing the junction, their world suddenly came to an abrupt end. They had been struck by the Fiesta which had pulled out of the junction, hitting the bike just behind the driver’s leg. John’s wife, Cynthia took the impact on her left leg at knee level. Bike and riders were catapulted across the road onto the opposite carriage way, where, fortunately, there was no traffic at the time. The car had impacted with its nearside front corner and the headlamp. It was later estimated that it was travelling at no more than 10-12 mph, and was still in 1st gear! The injuries to both riders were severe. Cynthia was air lifted to King Edward’s Hospital in London, and had to be resuscitated in the helicopter. She was subsequently to lose her left leg above the knee, the impact shattering it beyond repair. She also suffered severe skin damage to her right calf, but fortunately, there was no muscular damage, otherwise she could have lost her right leg below the knee. Cynthia also broke her right wrist. John was more fortunate, suffering ligament damage to his right knee, and breaking his big toe on his left foot. He also lost some teeth when his head hit the road. He was wearing an open face helmet with a clear visor. He was also wearing glasses, but does not use photochromic or sunglasses. Both of them were wearing good quality riding kit, which probably helped them reduce the scale of their injuries, which, nevertheless, were severe. John was taken by road to Guildford hospital, but went home that same night. Talking to John later, he said to me “I made eye contact with her.” He was convinced that she had seen him, as well. A few weeks later, when it had been established that Cynthia would survive her ordeal, the 80 year old driver of the Fiesta, when she was interviewed under caution by the Police, said that she thought that the bike had came at speed from the Guildford direction, and it was only when the Police woman taking her statement explained that John and Cynthia were travelling from the Dorking direction, that she apparently realised the enormity of what had taken place. She surrendered her Driver’s Licence on the spot. Fortunately for her, she will not be prosecuted for causing death by dangerous or careless driving, but will be for careless driving. No consolation for those who were injured, however, and whose lives have been irrevocably altered. This brings me back to my original statement. It is NOT safe to believe that eye contact has been made. In John’s case, he was wearing clear glasses, and a clear visor, and he thought that he had eye contact. Therefore, it stands to reason, that if we, as riders, are wearing sunglasses, or riding behind a tinted or possibly reflective visor, the driver of the hazard vehicle will NOT be able to make eye contact. The best he or she might be able to do in the circumstances is look at the crash helmet, but even that won’t guarantee that they have seen you. John is not an Advanced Motorcyclist, but I believe that in this scenario, even if he had been, sadly, it would not have altered this particular outcome. Some things cannot be allowed for, no matter how good we might be.